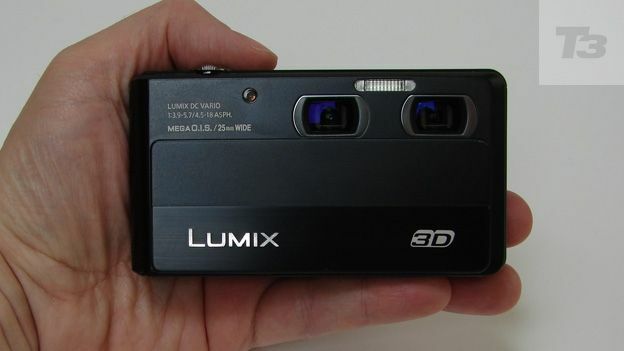 The Panasonic Lumix DMC-3D1 is the brand's inaugural, albeit pricey, 3D compact. Though smaller than the rival Fuji W3, can it justify its large price tag? Despite the big push on 3D in the home and at the flicks, there are still relatively few devices with which to create your own true stereoscopic imagery. We define 'true' as being cameras which deploy two lenses and two corresponding sensors with which to capture 3D shots and video, as opposed to single lens and sensor single snappers, such as Sony Cyber-shot and Olympus digital compact cameras, which alternatively generate a 3D effect via in-camera software trickery. Offering a small form factor with a depth of 24.1mm, and in that respect more portable than the brick-like Fujifilm Real 3D W3 and the W1 cameras of the past three years, is the Panasonic DMC-3D1. While the electronics giant has previously offered a screw-on stereoscopic optic for its single sensor Lumix G system cameras, this is Panasonic's first go at a standalone 3D pocket model. Like the competing Fujis, the 3D1 creates MPO file format 3D shots that, in the case of the Panasonic, can only be viewed on a suitably 3D enabled TV. There's the further option to shoot standard 2D JPEGs if you're envisaging a use for a shot other than reviewing it on the telly. However if you were to use the camera for this purpose in the main it would seem a foolhardy investment, considering suggested retail price is a hefty £449. That's the same as a lower-end Compact System Camera or digital SLR, providing much greater creatively flexibility if you're not wholly sold on 3D alone. This flat-fronted camera with internally stacked lenses is powered up simply by sliding down the lens cover and revealing said dual optics. As the 3D1 is, to all intents and purposes, a snapshot model Panasonic has tried hard to provide a straightforward and non brain-befuddling means of creating stereoscopic shots. So, while the top of the 3D1 resembles your average unthreatening £200 Lumix snapper, the backplate features an obviously marked switch for flicking back and forth between 3D MPO file generating mode and regular 2D JPEG shooting mode. However, at the risk of complicating things, there is still the opportunity to make use of the two lenses and sensors if shooting in 2D: for example, shooting a scene with one lens at its widest setting, and zooming on in the same subject with the other. The lenses boast a 4x optical zoom capability. The two images provided in 'wide and zoom' mode are displayed alongside each other on the camera's widescreen LCD, one 'main' image shown large, a secondary one displayed smaller. A finger tap lets you chop and change between the views. It's enough to make your head hurt, so the alternative to also just use one lens and take a standard 4:3 aspect ratio picture comes as a relief. In this manner, full 12.1 effective megapixel images can be captured. However if you're shooting in 3D and automatically opting for a 16:9 ratio image, resolution drops to 8 megapixels. There's also the option to get as close as 5cm from a subject in 2D mode, but not in 3D mode, where it's 50cm. Despite the pocket-sized proportions, the 3D1 shows it means business by parading a 3.5-inch touch panel, 460k-dot resolution LCD. This swallows up the backplate and leaves it devoid of physical buttons and controls save for that 2D/3D switch. The screen is used for both composing and reviewing stills and Full HD 1920x1080 pixels video as there's no secondary viewfinder. Unlike the most recent Fuji W3, which offered a lenticular-style display that gave the viewer an impression of how the 3D would look just by tilting the screen – and more importantly let you decide whether a shot was 'working' in 3D while you still had the subject in front of you – on the Panasonic's screen you can only view a standard, flat, 2D shot. We found this a little disappointing. The ability to see how a 3D shot looks anywhere and everywhere still gives the bulkier Fuji a distinct advantage. The Panasonic Lumix DMC-3D1 is supplied with a rechargeable lithium ion battery that will deliver 200 pictures from a full charge. That's no great shakes in comparison with what a non-3D shooting camera at the same price will deliver. But again, this isn't why you're buying the 3D1, and if it's stereoscopic photography from a pocket camera you're after there's not much else around, save Fuji, to provide a comparison. The W3 model provides just 150 shots from a full charge. The 3D1 offers not only the opportunity for 3D stills, but also 3D video, and from the same compact package, which provides this compact with a strong sales message. Video is output at 25fps, with the option of AVCHD or MPEG4 compression formats. Unless you are shooting in 2D, using the 3D1 requires you to think a little differently in terms of not only which subject matter you choose to photograph, but also how you place things within the frame. For example, apart from the obvious pointing a finger (or bazooka) towards the camera, arm extended, we've found 3D images tend to work best and look more 'layered' when there is something to draw the eye in foreground, middle and background of shot. Luckily the camera's 4x optical zoom can also be use when filming video clips. However, we did notice some loss of definition towards the corners of frame when shooting at maximum wide angle setting; that setting providing the equivalent of 25mm on a 35mm film camera, with up to 100mm offered at the opposite telephoto end. In terms of low light shooting, performance is roughly comparable to a £200 snapshot, with noise intruding from ISO800 upwards despite the high sensitivity sensor claims by its maker. Viewed kindly the 3D1 is a marvel of miniaturisation, with Panasonic able to squeeze two stereoscopic shooting 4x optical zoom lenses and sensors into a camera body of a similar width to a standard 2D pocket snapper. However, an asking price on a par with a DSLR may be rather more difficult to justify unless you really are one of those types who have everything and needs the missing piece of the jigsaw in your home 3D set up. That said the large 3.5-inch LCD screen is a boon for shot composition, as long as you're not attempting to mess with your own head by shooting through the two lenses at once in 2D mode. One for the early adopters at this stage the 3D1 may be, but certainly it's a step in the right, um, dimension.